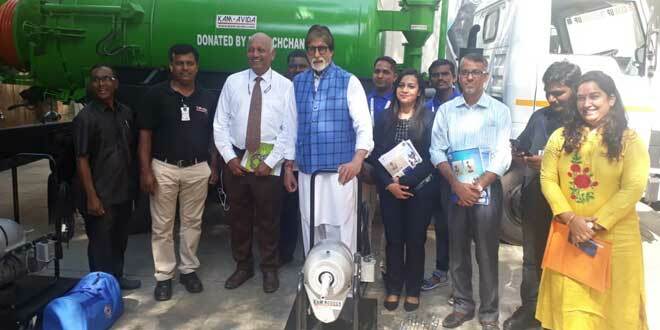 New Delhi: Amitabh Bachchan, the campaign ambassador of NDTV-Dettol Banega Swachh India, made a commitment of donating sewer cleaning machines to help fight the practice of manual scavenging and to contribute towards eventually putting an end to the inhumane practice. Mr Bachchan made the promise during the 12-hour Cleanathon organised on October 2 to mark Rashtriya Swachhta Diwas. Mr. Bachchan donated two small individual machines to two sanitation workers trained at World Toilet College, Aurangabad which trains sanitation workers in using a safe and an advance way of cleaning the sewers and drains. In addition one large truck machine was also donated to the Municipal Corporation of Greater Mumbai at Mr Bachchan’s home in Janak, Mumbai. The amount donated by Mr. Bachchan will also be used to provide individual machines for sanitation workers in Mumbai, Pune and Aurangabad. He has made this donation in a bid to stop the sanitation workers from physically entering the sewer pits and doing away with the inhuman practice of manual scavenging. The rest of the machines will be distributed to sanitation workers in an event to be held in December. On finding out that there were machines available to clean-up sewers, it was of immense wonder why the machine was not being used. So, on finding out the costs of each machine, knowing where personnel could be trained to teach them how to use them and to prevent the workers from manually going down sewers was the debate, I made a contribution of 50 such machines to be bought and put to use immediately so we can save lives and save the indignity of these workers. Manual Scavengers are given the most unbearable workstations of cleaning up the sewers of the city, sending them down the drains containing the sewage and the filth of the city without as much as a basic equipment to execute their job. They face disease, dangerous gases and have perished in numbers. Not just that, their living conditions do not give them the dignity of their labour, nor are they accepted in society as one of us; caste distinctions, alienation and health issues, not getting opportunity to work and jobs, associating with them as a society.. are all issues that these poor men had to go through. Mr. Bachchan also suggested to pen a new, more dignified name for people involved in sanitation work, while discussing the need to restore dignity and rehabilitate these people still engaged in this menial job. People die while manual scavenging because most of the time, they go inside the manhole and sewers without any protective gears and do not follow the precautions required like checking the level of toxic air before entering, as followed by sanitation workers in many western countries. The work involves cleaning the silt and debris from slurry manholes and choked sewer lines. There is an abundance of toxic deadly gases like Hydrogen Sulphide. These machines will clean the silt from the manhole and will un-choked the sewer lines without having anyone go inside physically. These machines are easy to operate and have been given to sanitation workers trained at the World Toilet College, Aurangabad. The concept of this machine is not new. We have sold more than 5000 machines to municipal corporations across the county till now. The bigger problem is of the lack of awareness and training of the sanitation workers. Usually, sanitation workers hired by private entities like builders, households in townships and colonies; neither have machines nor any protective gears which lead them towards death. Even when they don’t die, they suffer grave occupational hazards attached with manual scavenging because of getting in touch with the toxic water and air. These include getting ill due to septic, jaundice, diarrhoea and other diseases that push them towards death sooner than an average person. Manual scavenging refers to the practice of manually cleaning, carrying, disposing or handling in any manner, human excreta from dry latrines and sewers. Despite being made illegal way back in 1993, Manual Scavenging still prevails in India. According to the Socio-Economic Castes Census of 2011, there are 182,505 households involved in manual scavenging in India. No month goes by without a report of deaths due to manual scavenging in some or the other part of India. 1,760 manual scavenging deaths have been reported in the past two decades, according to Safai Karamchari Andolan, an organisation. The Central and the State governments have been taking steps to tackle the menace of manual scavenging including amending the Employment of Manual Scavengers and Construction of Dry Latrines (Prohibition) Act, 1993 and placing a new Act, Prohibition of Employment as Manual Scavengers and their Rehabilitation Act, 2013, on the table. The act provides for identification of the manual scavengers and rehabilitation them by providing skill training to them and enabling them find alternative means of livelihood. One of the measures that can help tackle manual scavenging is to use machines for cleaning the sewers, drains and septic tanks, which is what Mr. Bachchan feels can be a more practical solution to ending manual scavenging.